GameStop will have different store hours based on location. Make sure you call ahead to find out when your store will open. Many stores will open at 12:00am on Friday but several will not open until early Friday morning. 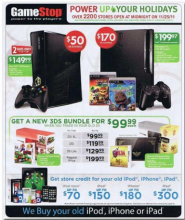 Here is a sneak peak at the GameStop Black Friday Ad. Below are a few of the top deals from their ad. *If you see something in their ad remember to price check with online retailers like Amazon.com andWalmart.com who have been adjusting their online prices to price match before the other stores open! Offers Nov 20, 2011 in BlackFriday, GameStop · Expired!